I don't normally editorialize. Everyone has an opinion and most people will think what they want to think, no mater how logical or factual my post. This post is not for people who have already decided and don't care what I have to say here. This post is meant for those looking for an unbias view and for the new collector who reads the blogs and forums for information, then comes into my store and says to me, "Everyone is saying........"
I have been collecting sports cards since 1957 (I was 9 years old) and I have been selling cards as a business since 1985. I've seen the evolution of the hobby to the point where I say the hobby has never been better. In the distant past, we all cherished autographs of our favorite stars. We got them in person, we got them in the mail from the athlete himself and we traded with our friends. In 1985, I paid $5 at a card show to have Mickey Mantle sign a baseball right in front of me. In 1982, I paid Bob Feller 50 cents each to sign autographs at a show. The point here is it didn’t cost much to acquire an autograph 35 years ago, so we never thought much about proving the autograph was authentic other than to say I got it in person. It’s quite different today. After winning his fifth Super Bowl, it cost you $800 for a Tom Brady Autograph Ticket at a card show last February. On his way to winning "Rookie of The Year", Dak Prescott Autograph Tickets were going for over $100 each at signings. Today, we are not only buying autographs of our favorite stars, we want proof that the autographs are authentic. Thirty-five years ago, a hobby box (Topps, Donruss and Fleer) cost about $10 per box but they contained no autographs. Today, hobby boxes with autographs range from $50 to over $1000. Licensing and costs to acquire authentic autographs and memorabilia have increased the cost to manufacture a hobby box. While all sports card manufacturing companies will have a company representative present during signings of its more expensive stars, many signings of less expensive athletes are done at their home and returned through their agent to the manufacturer with a signed statement by the athlete and/or agent stating the cards were signed by the athlete. Sometimes the card manufacturer will have a “representative” witness the signing of the cards. This “representative” is not necessarily a card manufacturer full-time employee, but often someone known and trusted by the company. I have served as a “manufacturer representative” for player signings. 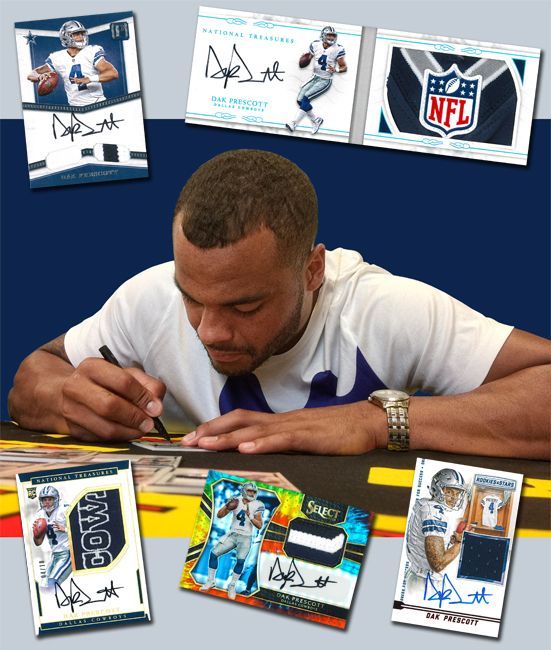 Dak Prescott, being a fourth round draft pick was offered and agreed to a rookie card signing contract to sign many thousands of cards at a price that turned out to be a great deal for Panini America and not so great a deal for Dak Prescott. This is not the first time a rookie athlete's rookie performance exceeded even his own expectations, making his card signing contract not such a great deal. In 2012, Russell Wilson was a third round draft pick. When he was working on a great rookie year, much like Dak Prescott, he decided not to continue to sign for Panini America until they renegotiated his contract for more money. Somehow, Dak Prescott auto-pen autographed Prizm cards were returned to Panini as Dak Prescott hand-signed autographed cards. The person responsible for this error in judgement has not been publicly identified. 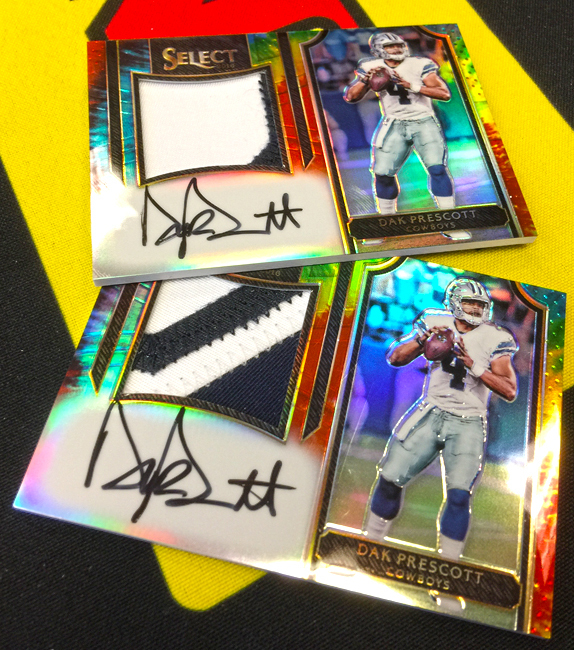 Panini America has taken the higher road, choosing not to publicly humiliate anyone and have extended Dak Prescott’s card signing contract so that Dak is now satisfied. Panini America made a good business decision. The collecting public wants real authentic Dak Prescott autographed cards. While a relatively few collectors (approximately 167 total cards) were impacted by the auto-pen Prizm autographs, it has caused quite a commotion in the hobby. Many collectors, even those not affected, want Panini America to call out the person to blame. This would not be a good business decision. It would only cause animosity with those (Dak, NFL, NFLPA) they wish to continue a good working relationship. Many on social media are angry that Panini America “rewarded” Dak with a signing contract extension. Panini America made a good business decision and extended Dak Prescott's contract. The vast majority of us want good, authentic Dak Prescott autographs in NFL products. A number of vocally loud collectors, are somehow blaming Panini America for this unfortunate situation and calling for the NFL and The NFLPA to cancel Panini America’s contract to manufacture football cards. This won’t happen. The NFL and NFLPA are both happy with their contract with Panini America. Sales of 2016 NFL sports cards hit record levels and demand for 2017 NFL sports cards may exceed 2016. With the internet at everyone's fingertips, we all search for information and answers. "Fake News", twisted facts and bias opinions are commonplace. Don't believe everything you read. Every card manufacturer has made some errors in the past. Recalls for automobiles are a common occurrence. We pay extra for extended warranties on home appliances because "stuff happens." The only people who don't make mistakes are people who do nothing. We as customers can only expect that the company we do business with, makes good on their promise in a reasonable time. Panini America has done a recall on these auto-pen autographs. 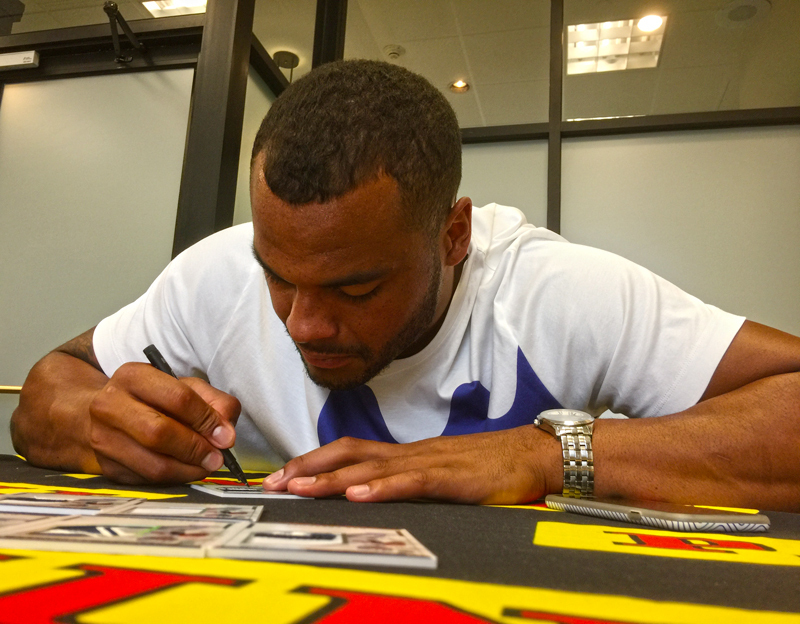 For those cards which got into the hands of collectors, Panini America will replace them with authentic hand-signed Dak Prescott Autographed Prizm Cards as per promised in the original redemption card. Panini America is doing all that can be expected in this unfortunate situation outside their control.